Most of my clients over the years chuckle when I tell them they should budget a hefty amount of time for the selection of bathroom plumbing fixtures. “How long can that take?” they wonder. “Isn’t a toilet a toilet?” Little do they know how many choices they have when it comes to selecting a commode. Toilets come in a standard height (measured to the top of the bowl) and a higher version. The higher toilets are 2 inches taller than their standard counterparts and go by the names “ADA” or “Comfort Height” among others. The “Comfort Height” toilets are considered handicapped accessible, and many folks find them easier to sit down on and stand up from than the standard height. Toilets also come in two different bowl shapes and sizes: elongated and round. Just as their names suggest, the elongated bowl is a narrower, oblong shape, while the round bowl is rounder. The round bowl takes up less space front to back, so in small bathrooms it can be easier to fit a round-bowl toilet in a shallow space. The tanks also come in many different heights, but unless you are looking to fit your new toilet under an existing countertop or other obstacle, the height of the tank usually comes down to style. Some tanks, indeed some entire toilets, have a more traditional or retro style, incorporating crown molding and other details into their designs. Others are very low and sleek, creating a more modern aesthetic. Still others have no tank – or at least it seems. 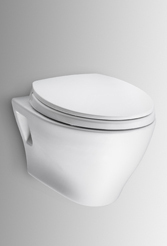 Toilets like the Numi Toilet from Kohler incorporate it right into the bowl. Others hide their tanks in the wall, like this one from Toto (which can be installed at nearly any height you choose). When choosing the style of your toilet, consider the style of the entire space. Use a contemporary style in a modern space and a traditional style in a retro space. If you desire, you can often find a coordinating sink to use in the bath, as well. Typically, but not always, the color of your sink, tub and toilet will be the same. Be very careful when choosing the color of your new commode. Have you ever seen a pink toilet in an old home. Yup. Me, too. And the proud owners of that toilet are likely several generations younger than the folks who installed it. And yet, it endures. The best tip I can offer you in terms of color is this: go neutral. Unless you have a large pot of money waiting to be spent every 5 years on a new, trendy toilet (and the coordinating tub and sink to go with it), choose white, biscuit or perhaps a light gray toilet. These colors will be much less trendy, standing the test of time. As you shop, you may also find toilets with a “concealed trap” option. The trap is that snakey-looking tube under the tank/bowl. A concealed trap smoothes out that whole area, making it much easier to clean. Also, did you know that toilets come in one-piece and two-piece options? No, we’re not talking about bathing suits here. One-piece toilets have their tank and bowl sections made in – surprise – one piece. Two-piece toilets have tanks that are bolted to the bowl at the time of installation. Some folks prefer one-piece toilets, as they are easier to clean- no seam where the tank meets the bowl. However, they are more expensive than their two-piece counterparts. You’d think that would be the end of your toilet-selection expedition. You’d be wrong. You also need to look at the mechanics of the toilet before you place your order. 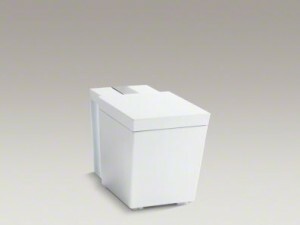 To save water, consider a toilet with a 1.28 gallon flush; there are even options that flush with less water than this! 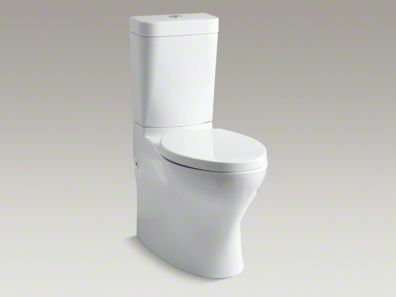 Technology has come a long way, and if you buy a quality toilet with a water-saving option (consider Kohler or Toto for two great options), they will flush as effectively as their water-guzzling cousins. You will also find a few toilets offering dual-flush options; a lighter flush with less water for (ahem) no solids, with a larger flush for…well, you get the idea. A few more minor details and you will be all set to make your toilet purchase. What side would you like your flush lever located? Often, you can choose to have it on either the right or the left side (if it isn’t already located on the top of the tank). You can also usually choose the color of your “trip lever” (as these are known)- satin nickel, oil-rubbed bronze, chrome – all are great options and allow you to coordinate the lever with the other metal finishes in your space. Now, you need to choose a seat. Yes, seriously. Seats rarely come with toilets (unless you are buying an all-in-one-kit at the big box store). There are painted wood seats, plastic seats, self-closing seats, heated-bidet seats…you’d be amazed at the options out there. Choose what you like, and what your budget will allow, making sure the color will match the toilet (choose from the same manufacturer for best results) and that the size and bowl shape match. Great useful article about your tips for selecting a new toilet. I especially like the section about the one piece toilets. As a licensed plumber in the field, I sometimes come across 2 piece toilets that leak from the tank to bowl gasket seal. Over time the tank to bowl gasket seal can get old and brittle and spring a leak. If a leak is not noticed quickly it can cause a lot of water damage in a very short period. 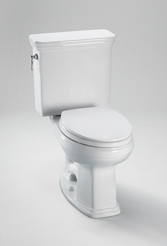 A one piece toilet does not have a tank to bowl gasket seal and cannot leak. No gasket seal means less maintenance required. Thanks for sharing.